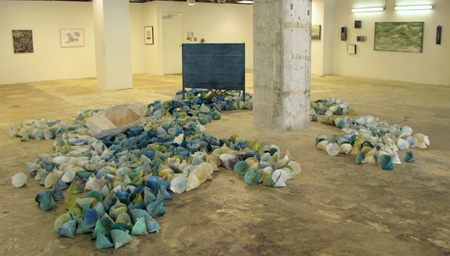 Christel Dillbohner, 'Large Ice Floe,' 2012, installation. Here she fills an industrial-looking space with a show entitled "Nothing is Certain," a phrase which certainly captures the current economic zeitgeist, but is employed here to express the “sense of displacement and vertigo” caused by threats to the natural environment. The drawings, paintings, assemblage sculptures and installation, many subdued in color or composed of battered, corroded metal and wood, have an austere lyricism that is nicely accentuated by the concrete pillars, exposed ductwork, and popcorn-sprayed utility boxes of the gallery.